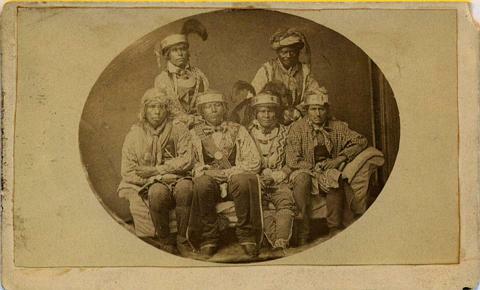 Seminole delegation (1852) – I am only sure of the third chief seated (from left): Billy Bowlegs. Who are the others chiefs? Do you know if photos or paintings exist of the 4 famous Seminole chiefs: Alligator – Arpeika – Jumper - Wild Cat? The most important were John Jumper (son of the great chief Jumper) and Billy Bowlegs (nephew of the great chief Micanopy). And finally, another version of the sketch that appeared in Harper's - this time signed and dated 1858! Long Jack - I think he was one of Bowlegs' warriors, 1858? From this we learn that Long Jack, pictured above, was the brother of Bowlegs' young wife. Thanks very much Charlie, Dietmar, and Grahame! Billy Bowlegs is perhaps the best known of his time. Unfortunately, people in my area of Florida -- the northwest Panhandle -- have given his name to a pirate, so his legacy has been corrupted in these parts. Somehow they have managed to link Billy Bowlegs -- the pirate version -- to a Mardi Gras-type festival in June. It just dawned on me that all three of you are European so you probably don't know or care about Mardi Gras! Sorry! Chief Billy Bowlegs is very respected around the Lake Okeechobee area. The Peeples family who owns the ranch where Bowleg's camp used to be, are very proud of the fact and are very accommodating to any of Bowleg's descendant. I will like to bring attention to a not so popular leader,Sam Jones,(Abiaki), Medicine Maker and a war Chief. This is a rare thing as in most Native Cultures, the War Chiefs consult with the Medicine Maker for advise, blessings, songs, etc. Sam Jones was both. He participated in all the Seminole Wars and lived to guide all Seminole War Chiefs. A true Seminole Legend. He was 52 when Billy Bowlegs was born and out lived Bowlegs by 8 years, when he died in 1866 at the age of 106. Today Highway county road (CR)833 in Hendry County runs over old Sam Jones Trail. The trail ended at the Caloosahatchee River, just south of Chief Bowlegs camp. There are many statues of Abiaki found throughout various locations in South Florida. One is at Tree Tops Park in Davie, where his camp used to be. Multiple Statues of him found at the Big Cypress Seminole Reservation, where he is buried, in an unmarked grave. He is held in the highest regards,second only to Chief Osceola. Thank you, Second, that is interesting to learn about. Would be nice to learn more about the lives of Billy Bowlegs as well as Sam Jones / Abiaki.